I had a variety of fresh herbs left over from making herbed focaccia, so I bought a small log of goat cheese, covered it with herbs, and enjoyed it warm with grilled vegetables. Crumble it and use it in recipes the way you would with plain goat cheese. When entertaining, this makes an elegant spread for crackers and it makes a great addition to any cheese platter. Ensure that the goat cheese log is chilled through and keep it in the refrigerator until you’re ready to use it. 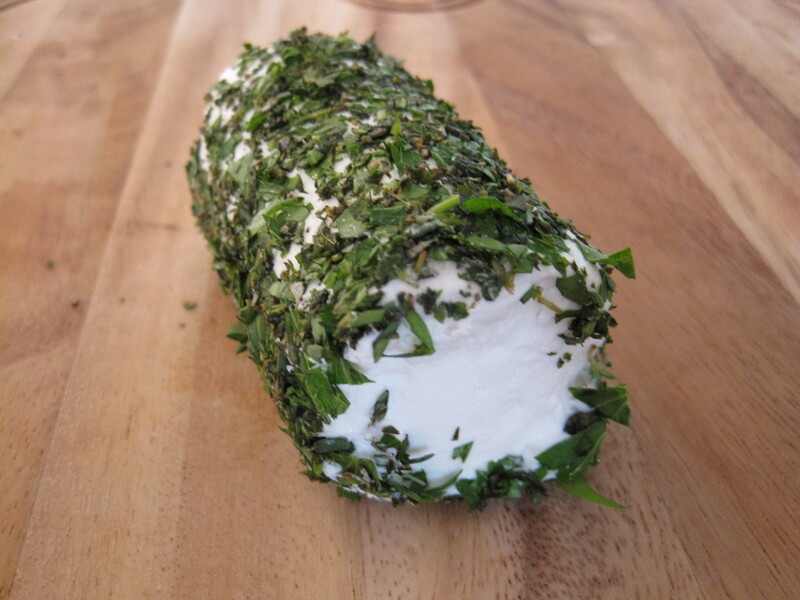 On your clean work surface (I used a cutting board), combine your chopped herbs and black pepper in a condensed pile that is just large enough to coat the part of the goat cheese log that will touch your board when placed horizontally. Working quickly, remove the log from the package. Place the log horizontally onto your herbs to coat one side well. Gently lift the log to expose the remaining herbs. Gather your herbs into a condensed pile if necessary, and coat the adjacent side of the cheese with the herbs. Repeat until the goat cheese is covered all the way around, leaving the two ends plain.